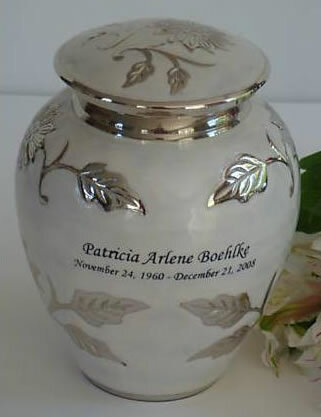 The very popular Small Pearl White Florentine Brass Urn is solid brass urn with an pearlized enamel finish decorated with a nickel (silver color) embossed flower and leaf pattern on the urn and lid. Please limit engraving to no more than 20 letters/numbers/spaces per line. Approximately 5.5 inches high with a volume of 45 cubic inches. Suitable for most infants and small children with healthy body weights of less than 30 pounds. Is this urn the right size? We follow the guidelines set by the Cremation Association for North America (CANA). Their standard for an adult urn is 200 cubic inches. In many cases, this can be off by 10-20% in either direction depending on many factors. For all urns, the industry standard for rough estimates is 1 cubic inch of cremains for every 1 pound of healthy body weight. This industry standard should only be used as an approximate size required. Usually ships same day if ordered by 12pm EST.